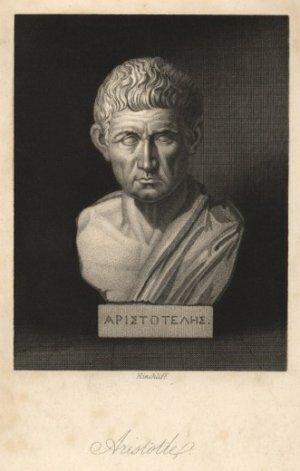 Aristotle (AR uh stot l) lived many years ago. He was born in a Greek colony about 350 years before the birth of Christ (B.C.) His father, Nichomachus (ni koh MAH kuhss), was the physician for the king of Macedonia. Unfortunately Nichomachus died when Aristotle was quite young and he was put in the care of a guardian. When he was 17 years old he was sent to Athens to study. Athens was a center of learning and he joined the Academy and studied for twenty years under Plato (PLAY toe) who was the foremost philosopher* and teacher of that time. 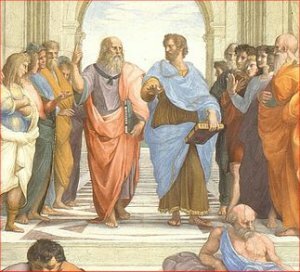 When Plato died Aristotle expected to be appointed as his successor, but his ideas differed from those of his teacher, and Plato's nephew was chosen to teach at the Academy. He left Athens and went to Mysia where he taught for three years in the king's court and married the king's daughter Pythias. They had a daughter and Pythias died when she was a young woman. Some writers claim that Philip, king of Macedonia, invited him to come and teach his son Alexander who was 13 years old at the time. He tutored him for five years. This same Alexander would later go on to conquer the then-known world. He returned to Athens. Plato's school was now under a new teacher, Xenocrates(zih NOK ruh teez). Aristotle set up his own school, the Lyceum* (li SEE um). He would teach there for 13 years until he had to flee the country. The school he started continued for more than two hundred years. 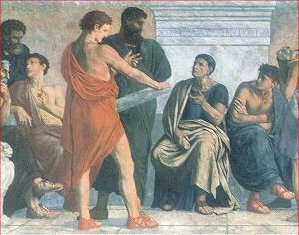 Aristotle walked around as he taught and his students would follow him and listen to his lectures. They became known as the peripatetics (per uh puh TET iks) a word which means to "walk about". When Alexander the Great suddenly died Aristotle left Athens because the government had been overthrown and his life was in danger due to his background as a Macedonian. Aristotle was a genius. He studied many different subjects; science, plants, animals, the human body, weather, the earth, the heavens, politics, government, ethics* and philosophy. He created a system for organizing and catagorizing things which formed the basis for modern day thinking. He taught moderation, urging his students to follow the middle road between extremes. He defined virtue* as the disposition of the soul that promotes human flourishing. He said it was cultivated through training, and through virtue people could find the meaning of life and develop character. The central question of ethics according to Aristotle was, "What kind of person ought I to be?" Aristotle said you need virtues not because you are going to be punished for wrongdoing, but you need them in order to be happy. He set the standard in regard to virtues and vices. * Aristotle and Plato were in agreement about virtue. They both taught that man should live a virtuous life, but they differed on many other things. Plato envisioned an ideal form of government; a utopia* ruled by philosophers. 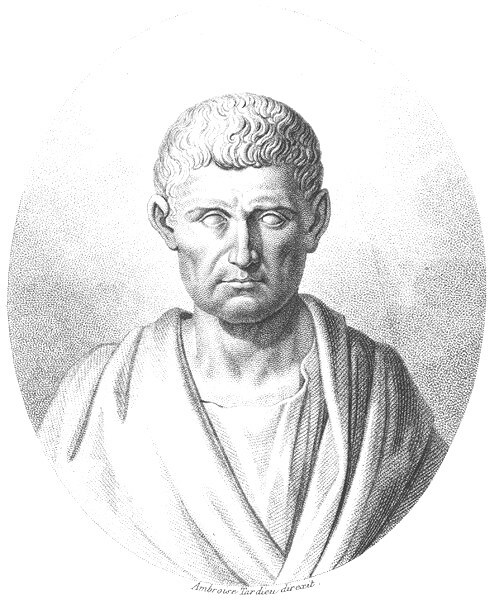 Aristotle thought common men of virtue were capable of governing themselves. "If liberty and equality, as is thought by some are chiefly to be found in democracy, they will be best attained when all persons alike share in the government to the utmost." The first was the material cause or the material out of which something is composed. We will use the example of a spoon. The spoon is made of metal. The second was the formal cause or the plan that caused it to exist. The spoon was designed by a craftsman who planned its shape and size. The third was the efficient cause or that which brings something about or causes it to be. We know it is a spoon because it has a bowl shape on one end and it has a handle for holding it. And the fourth was the final cause or the purpose of something. The purpose of the spoon is that it is to be used for eating. Major premise: all children are human beings. Minor premise: Chris is a child. Conclusion: Chris is a human being. Later in life Aristotle had a son whom he named Nichomachus, giving him the name of his father who had died when Aristotle was young. When he left Athens after the death of Alexander, he went to the island of Euboea. He died soon afterward in 322 B.C. at the age of 62. Etymology: Middle English vertu, virtu "behavior that fits with what is right or moral,"
from early French virtu (same meaning), from Latin virtus "strength, virtue, manly quality,"
b: a moral fault or weakness "dishonesty was his vice"
2 : an unimportant fault "eating too much candy is my vice"
Press "Go" to search for books about Aristotle. Order the following book from Amazon. This page displayed 53,798 times.